Later, living alone in New York, she began preparing a healthy variation of the dish she discovered in Judith Jones’s cookbook The Pleasures of Cooking for One. She’d saute spinach, form the greens into a nest, and slide an egg into the center to poach. Now living back in her home state, White fuses the two versions with a Southern inflection. She uses whatever local greens look freshest at the farmers market. And for croutons, she cuts leftover cornbread into rounds and fries them in butter and olive oil. This recipe makes one serving, though it is easily doubled. 1) Slice cornbread in half lengthwise. Cut out rounds with a 1-inch biscuit cutter. 2) Heat 1 tablespoon of the olive oil with the butter in a skillet over medium heat. Add the cornbread rounds and fry on both sides until crispy. Remove to a paper towel. 3) Heat remaining tablespoon of olive oil in a lidded skillet over medium heat. Add the garlic powder and red pepper flakes; saute until lightly toasted. Add the greens, stirring 2 to 3 minutes until wilted. 4) Crack the egg into a small bowl. 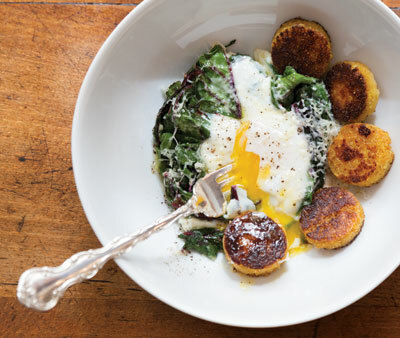 In the skillet, form the greens into the shape of a nest, then make an indentation in the center and immediately slide the egg into the hollow. Pour about 2 tablespoons of water around the edge of the pan, cover with a lid, and let steam 2 to 3 minutes or until a white film forms over the yolk. 5) With a slotted spoon, carefully lift out the egg and greens onto a plate or into a shallow bowl; sprinkle with cheese, season with salt and pepper, and drizzle with olive oil. Serve with cornbread croutons. This story originally appeared in our October 2013 issue.